Most advanced avionics systems include receivers for conventional radio navigation signals from VOR, localizer, and glideslope transmitters. To display these signals on the navigation display indicator(s), you need two fundamental skills. The first fundamental skill in ground-based radio navigation is tuning and identifying a ground-based radio navigation facility. Figure 3-59 illustrates how a VOR station can be tuned using two different systems. Some systems automatically attempt to identify ground-based radio navigation facilities that are selected by the pilot. Note the identifier that appears beside the selected frequency in the upper left corner of the PFD in Figure 3-59 (116.00 = ECA). 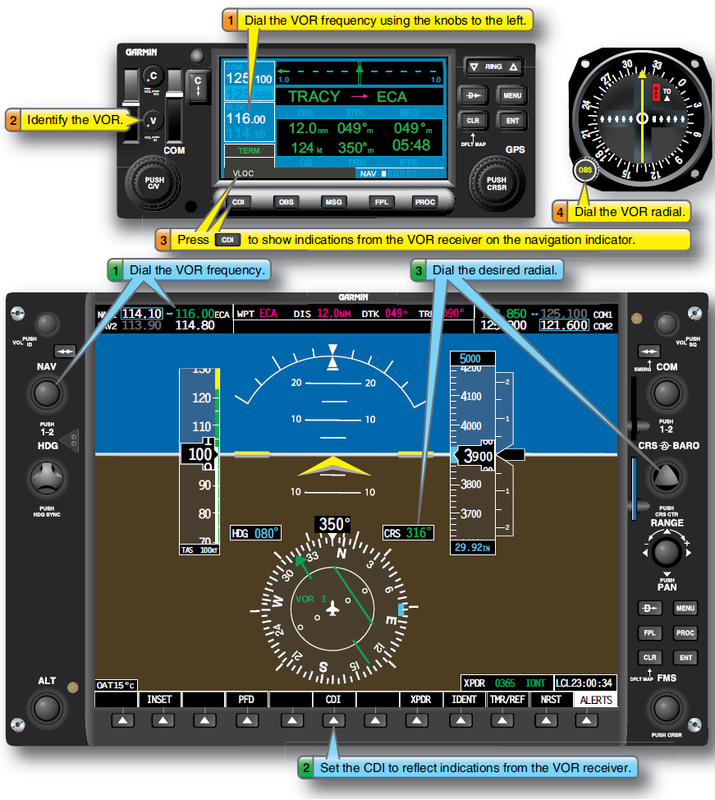 The second fundamental skill is displaying indications from a ground-based radio navigation facility on the navigation display indicator in the aircraft. In addition to setting the navigation indicator to display indications from different navigation sources, you must also know where to look to double-check which indications are currently being displayed. It is crucial to remain constantly aware of the navigation source for each indicator. Many systems use color coding to make a visual distinction between different RNAV navigation sources (GPS, INS, etc.) and ground-based radio navigation sources. Looking at the two systems shown in Figure 3-59, you can see that two VOR frequencies appear in the active windows at all times, regardless of whether VOR or GPS is being used as the primary navigation source. To maximize situational awareness and make best use of this resource, it is a good practice to keep them tuned to VOR stations along your route of flight. If you have two navigation indicators, you can have one indicator set to show GPS course indications, with the other to show VOR indications. Used in this way, VOR and GPS can serve as backups for each another. Flying a precision approach requires tuning the required frequencies, configuring the navigation indicator to display localizer course indications, and flying the approach. For aircraft equipped with multiple navigation radios, the localizer frequency can go into one receiver, while a second navigational facility used as a cross-radial can be set in the other receiver. As you come within range of the localizer and glideslope, the course deviation and glideslope indicators will show position with respect to the localizer and glideslope. Nonprecision approaches such as VOR, localizer, and LDA approaches are flown using the same procedures used to fly a precision approach. If the aircraft is equipped with an autopilot, be sure to develop a thorough understanding of how the autopilot works with the FMS. While these systems automate some tasks, others (e.g., flying the procedure turn course reversal) maybe left to the pilot. Advanced avionics systems offer you several ways to navigate. Numerous studies have demonstrated the potential for deterioration of navigational skills that are not regularly practiced. It is important to get regular practice using groundbased navigation facilities as well as RNAV sources. One way to maintain proficiency is to consistently use ground-based navigational facilities as a backup to RNAV systems. Select any type of ground-based radio navigation approach. Correctly tune and set up the conventional navigation receiver for that procedure. Correctly monitor the navaid for properly identification and validity. Correctly select and be able to use the desired navigation source for the autopilot.